Maintaining this reserve has been the subject of one of our long-term collaborative projects with the Surrey Wildlife Trust. We are now taking on more responsibility for the site following the restructuring of the Trust’s countryside team and have volunteered to look after it, as it is the only SWT reserve in The Bourne. It is the Trust’s smallest reserve, with an area of just 0.18 hectares, and is situated on the northern slope of the Bourne Valley not far from the Bat and Ball Public House (at SU 832 444).In 1986 Mrs Doris Underdown donated the site to the Trust in memory of her husband Harold Underdown, who had been Town Clerk at Farnham Urban District Council. According to the 1762 Rocques Map of Surrey and the first Ordnance Survey Map of 1816, the site is the last remnant of Farnham Common heathland; heather, gorse and broom still grow there, but these heathland plants will soon be lost if there is no maintenance so that trees and scrub are allowed to take over. All the rest of the old Farnham Common is now covered with the South Farnham suburbia. The reserve is a narrow strip of steeply sloping ground on Greensand, which is partially covered with woodland. Where the unstable slope is bare, the sandy soil provides an ideal habitat for solitary bees and wasps to dig their nest burrows. 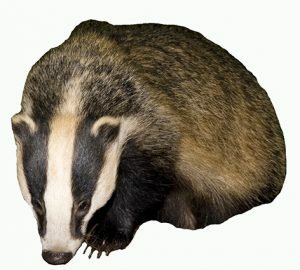 The sandy soil with the Bourne Stream nearby also provides ideal habitat for badgers, and the large active badger sett is the principal feature of the reserve’s interest, but it is too small to withstand large numbers of visitors. Apart from the badgers, surprisingly little is known about the site’s fauna and fora. Some surveys were conducted in 2000, when about 50 invertebrates were identified. 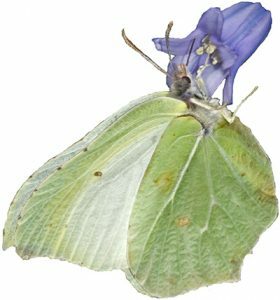 These records included just 6 butterflies but not a single moth, just four mammals and 14 birds – clearly a lot of recording still needs to be done if the site’s full conservation value is to be recognised. The plants are better known with records of 79 flowering plants together with 16 grasses and a handful of lower plants. the constant removal of rubbish that is either fly-tipped or thrown over the fence by walkers passing along the footpath by the Bourne Stream. repairing the fence and gate. the removal undesirable invasive plant species such as snowberry, black cherry and sycamore. planting a new hedge along the western boundary – a task to which we contributed not only man power but also financially through buying half the new hedging plants. 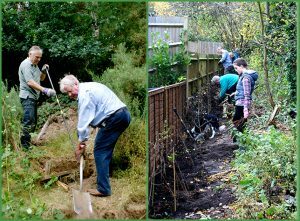 clearing scrub from the steep slope and opening up the lower areas to let in more light and so encourage the development of the ground flora. felling one of the dangerous pines and several of the unwanted sycamores and black cherry. 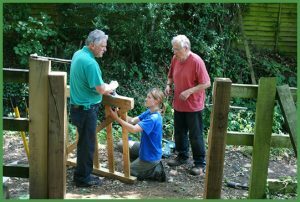 Helping Fiona Haynes, the former SWT ranger, to renovate the gate into the reserve. Clearing unwanted trees – Left a sycamore which was casting heavy shade and preventing the ground flora from flourishing: Right cutting up a dead pine tree for health and safety reasons. Left- digging out snowberry and rubbish. Right – planting a hedgerow of native species along the western boundary. conserving and encouraging the growth of the old heathland plants – heather, broom and gorse. minimising any disturbance to the badgers. improving the definition of the boundaries and maintaining and extending the native hedgerow. 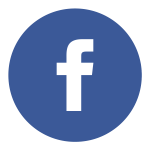 advising SWT about any on-site health and safety issue that arise, as there is free access for the public. maintaining good relationships with the neighbours. This work is good exercise, great fun and highly satisfying – in addition there will always be the intellectual stimulus of the lively discussions that occur during the coffee break about conservation and local issues.